Lien Truong and I met a few years ago during an opening for her solo show at The Carrack in Durham, NC. We share a common interest in everything about fabric, from the history of textiles to the physical qualities of fabric. This is my first visit to Lien’s studio in Chapel Hill, NC. 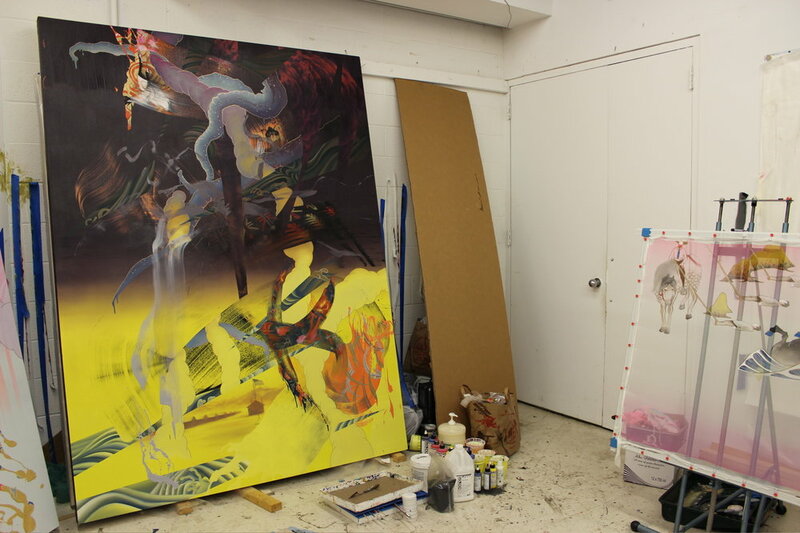 Lien’s studio is lined with massive paintings in progress from her series called Mutiny in the Garden. She’s working on a deadline for a solo show and has been pulling some late nights. Her Mutiny in Garden series includes large paintings with gestural strokes of bright colors and realistically painted imagery melded together into chaotic all-over compositions. 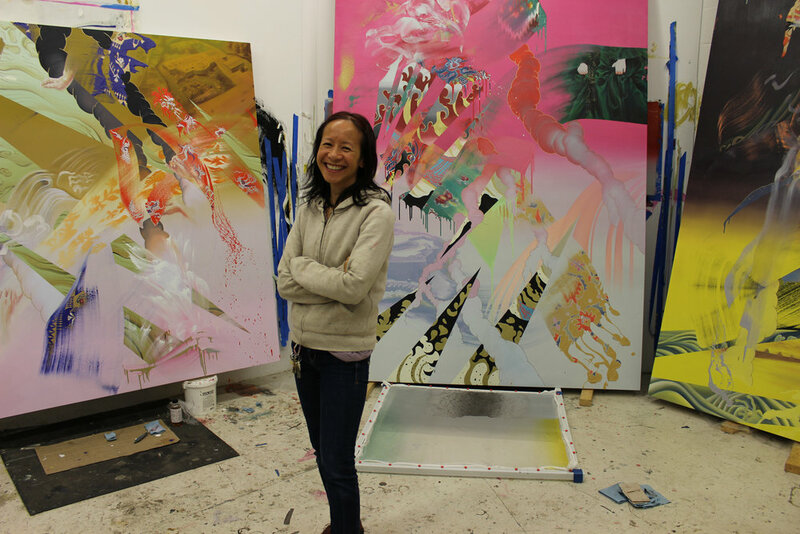 In her statement about this series, Lien says that her “works are a frenetic amalgamation of western and Asian painting techniques and philosophies. Working within a type of blended history painting, the works agitate notions of a dominant painting lens.” These history paintings are piled high with snippets from America’s violent and racist past and present, pointing to upsetting truths and examples of resistance and protest. The series is based on themes from Hudson River School painter Thomas Cole’s The Course of Empire, in which he paints a landscape from its “savage” or natural state through humanity’s rise, destruction, and final desolation. I ask Lien how she typically starts her paintings. She’s not big on sketching things out. First, she selects the landscape and textile designs which lead her to the colors for the gestures and background. Examples of the landscapes depicted in the series include the Dismal Swamp, Monticello, and Newtown, CT. Lien tells me that the gradient background functions as a hybrid of the horizon line found in Western art and the void found in Asian art. After adding gestural swipes of color, she intuitively decides where to place historically significant landscapes and painted textile samples. She works back and forth between the intuitive and the realistic components, striking a volatile balance between the two. Throughout the series, Lien paints ocean waves using a traditional Asian approach to painting water, which she says relates to immigration. Attaching the clusters of painted silk panels and sewing the lines of gold leaf obi thread are the final steps. The moments of abstraction within Lien’s paintings offer a brief pause from the chaotic compositions and references to violence. Lien stresses the importance of taking time to just sit with her work and look. She says she will sometimes take pictures of the works and look at them when she’s at home. I do the same thing. When I’m at home, I draw on top of the smart phone images of the work in progress so I have some notes for the next time I am in the studio. Our visit goes in and out of the past and the present. We each talk about how our bodies of work have changed and evolved in ways that we had not anticipated. The concept of unlearning is on both of our minds. We talk about our need to unravel certain aspects of the ever-present white male perspective from our own approaches to making art. 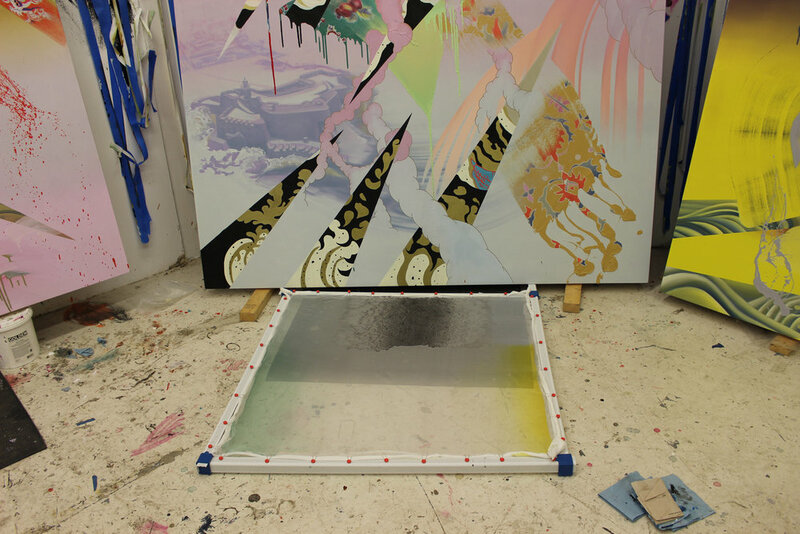 Lien loves the work of Kerry James Marshall and has been influenced by his work for a long time. Other artists we talk about include Inka Essenhigh, Shinique Smith, Alicia Gibson, and Eva Hesse. Lien shows me her set up for painting on silk, which seems like a labor intensive process. The silk painting she’s working on now depicts the lynching of Mexican-Americans by the Texas Rangers. The silk is stretched with little claw-like hooks attached to a lightweight frame. She uses high flow fluid acrylics and metallic paint pens. After the painting is complete, she cuts it into panels. The raw edges of the silk panels are burned. The silk used for the clustered panels attached to her paintings comes from China. She tells me about traveling to Vietnam to find some authentic silk. Due to the high demand for silk, there are many fabrics that are a blend of synthetic fibers and silk. On her trip, she met a silk maker in a village outside Hanoi who taught her how to test silk for authenticity. The way to prove if silk is real or synthetic is to burn it. Synthetic fabrics melt when burnt. Pure silk burns, and the singed portions easily break off. The concept of authenticity is a significant theme running through Lien’s work. Turning to a painting in progress that is predominantly yellow and black, Lien tells me how this one explores the Asian-American experience. The middle of the yellow portion of the painting features Manzanar, one of the Japanese Internment camps located in the United States where Japanese American citizens were incarcerated because of their race from 1942 until 1945, during WWII. Surrounding the depiction of Manzanar are sweeps of color on which she realistically paints specific fabric patterns from Japanese textiles from the mid 1900s. The painting makes references to the racist Yellow Peril ideology which depicts East Asians as a monstrous threat to the white Western world. This ideology was first used by Germany as a means of spreading white supremacy in the colonization of China and Japan in the 1890s. Fred Korematsu and Richard Aoki are also referenced in this painting. After our visit, Lien sends me an image of the completed painting along with the title, The Peril of Angel's Breath. The Peril of Angel's Breath, 2018, oil, silk, acrylic, American 19th century cotton, vintage obi mourning fabric, gold leaf vintage obi thread on canvas, 96" x 72"
The clusters of cut silk panels offer some physical breath to the work as they are free to move and flutter. Lien paints textile patterns from different historical eras and geographical regions in each painting from the series and also includes a few collaged pieces of fabric. The textile patterns are wrapped up in the gestural marks. Lien tells me these gestures refer to the body and Abstract Expressionism, but instead of being purely about the ego, they are about people, the collective as opposed to the individual. After talking about the power dynamics of the textile trade, we move onto which metallic paints are the shiniest. Each painting from Mutiny in the Garden is packed with numerous historical and contemporary references, many of which deal with violence against people of color in America. Lien intentionally includes recent examples of resistance and protest too, like the toppling of the Confederate monument in Durham to scenes of the Dakota Access Pipeline protest. During the time it has taken me to write about my visit with Lien, the long protested Confederate monument on UNC’s campus known as Silent Sam was pulled down by anti-racists. The same painting depicting the toppling of the Confederate monument in Durham, which Lien completed earlier in 2018, also includes a representation of the Silent Sam statue with a black bag over its head. History painting indeed. Mutiny in the Garden, 2018, oil, silk, acrylic, antique 24k gold-leaf obi thread, 19th century American cotton on canvas, 72" x 96"
Lien Truong’s solo exhibit at Galerie Quynh in Ho Chi Minh, Vietnam, will be on view from October 19 through November 24, 2018.